Michael Richard "Mike" Pence is an American politician. He is the Vice President-elect of the United States, as well as the 50th and current Governor of Indiana. He is scheduled to take office as the 48th Vice President on January 20, 2017. 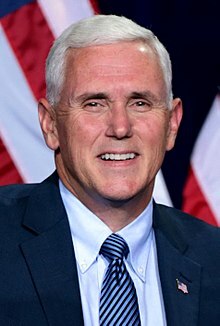 Michael Richard "Mike" Pence (born June 7, 1959) is an American politician. He is the Vice President-elect of the United States, as well as the 50th and current Governor of Indiana. He is scheduled to take office as the 48th Vice President on January 20, 2017. Since Pence became the governor of Indiana on January 20, 2013, he has implemented the largest tax cut in Indiana's history, pushed for more funding for education initiatives, and continued to increase the state's budget surplus. Pence signed bills intended to restrict abortions, including one that prohibited abortions if the reason for the procedure was the fetus's race, gender, or disability. Pence also stirred several high-profile controversies and after signing the Religious Freedom Restoration Act, Pence encountered fierce resistance from moderate members of his party, the business community, and LGBT advocates. He was forced to sign an additional bill acting as an amendment intended to protect LGBT people.